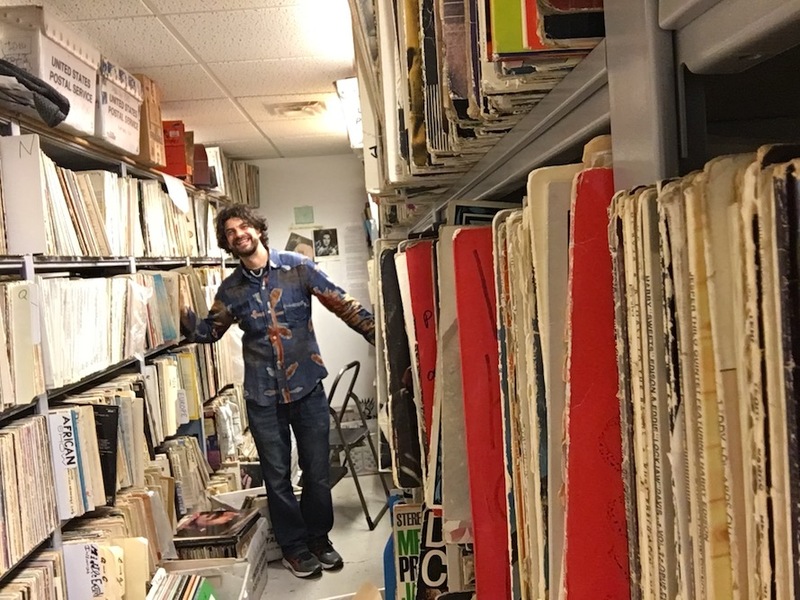 With less than a week until the sixth annual fest at the Rubin Museum of Art, WSWD was lucky enough to snag Ellenbogen for a chat to discuss his long history studying, producing, and sharing eclectic music in NYC. What Should We Do?! You serve the world of music in so many capacities—as a performer, producer, broadcaster, and curator. When did you first realize you wanted [to pursue] a career in this field? —to create an environment where they can have a transformative experience, but also just have fun and meet other like-minded people. I later fell into a job at Columbia University when it was starting the Center for Jazz Studies. The idea that I could get paid to help Ron Carter move his bass at some point was too good to be true! I figured out a way to get a bunch of partners from other parts of the university to cosponsor events, and soon I was producing concerts like the annual Sun Ra Arkestra Halloween Haunt at no cost to my boss. I got the Faculty House to donate 2,000 pounds of dry ice for that! The legendary producer George Wein, who created the first American music festival, Newport Jazz, in 1954 (and later the Newport Folk and New Orleans Jazz and Heritage festivals), attended one of these and hired me soon after. WSWD: The genres that you are involved in are limitless. What do you gravitate toward when booking an artist for one of your productions, your radio show, or your own artistic collaborations? Ellenbogen: Though it’s never spoken of, I think the communities I’m drawn to all indirectly or directly view music as sacred. A lot of these people are really rooted in a tradition, but they’re also curious to learn about sounds beyond their boundaries. I like music that’s mind-blowing. Frank Zappa once said, “Music is the only religion that delivers the goods.” Many of the artists I’ve been lucky enough to work with—such as Roman Diaz, Innov Gnawa, Awa Sangho, Dana Hanchard, and Jay Gandhi—definitely deliver those goods! WSWD: How did your interest in raga music start? WSWD: How did you decide to put together a 24-hour fest at your radio studio? Ellenbogen: I’ve been on WKCR since I was a kid in 1997. I grew up listening to 89.9 FM and took a summer literature class at Columbia just to get on the radio and get into that record library. When I returned from Calcutta, I wanted to learn more about Indian music; I just wanted to lay eyes on those magical instruments. For years on the radio, I had an open door to any musicians who played raga. A supercool Turkish student at the time, Ahmet Ali Arslan, was excited by what I was doing and came up with the idea of the 24-hour festival. It’s a natural idea because raga is time specific; there are ragas to match the feeling of the sunrise or midnight. Brooklyn Raga Massive had just formed, so I reached out to them and a few other organizations, like HarmoNYom and Chhandayan, to make it happen. WSWD: For the first four years of this festival, it took place just in your studio. This is your second year doing the fest live—what are you most excited about this time? Ellenbogen: I can’t imagine anything more special, fun, or unique than an overnight experience in the Rubin; it specializes in Himalayan art, so it’s an inspiring setting for this. Sameer Gupta and Arun Ramamurthy from Brooklyn Raga Massive have curated an amazing lineup of artists. I’m particularly excited about the 9 p.m. set with Ganavya Doraiswamy; I get choked up every time I hear her. A unique thing about this festival is that we treat raga as a living tradition. There are many fascinating groups and artists who are inspired by the form and also bring other parts of themselves and their experiences to the music. It’s fresh music, being created right now in New York City. WSWD: What do you hope audiences take away from it? What can they expect with the 50-plus musicians you’ve lined up? Ellenbogen: Something very transformative happens in an immersive experience like this. Raga is a subtle science, and the music doesn’t just harmonize with the various instruments; it harmonizes with the time of day. It’s also special that we will be broadcasting it live on WKCR-FM. People all around the world will be listening; it will be a global community of people concentrating on the subtleties of a single note. This shared experience is medicine we can all use a dose of. WSWD:Hopefully you’ll get some rest post–Ragas Live! After that, what’s next for you? Ellenbogen: Well, I’ll have to get all 24 hours of Ragas Live uploaded to NYC Radio Live—that podcast is my life’s work. In a hundred years, I hope someone comes across this archive and thinks, Oh! People from all around the world were coming together and making amazing music. I think that people who love to dance should have some more organic and globally minded offerings, so the next big project is Trance NYC. I’m scheming with Hatim Belyamani (aka H.A.T.) to create a series that will feature traditional global trance music artists such as Innov Gnawa or La Troupe Makandal working together with electronic acts to create collaborative sets. Olga Morkova and I recently started World Music Education, in which we reach out to all these world-class musicians I’ve been talking about. The idea is to expose children to musicians from all around the planet. The trope that listening to Mozart makes your children smarter may be true, but then it would follow that Afro-Cuban rhythms and Arabic Maqam would be equally mind expanding. We’ve been doing weekly classes and it’s been a lot of fun. I am superpsyched for the Outside (In)dia Series, which is being produced by the India Center Foundation, Lincoln Center, and Brooklyn Raga Massive. This series takes a really expansive view on what raga can be in NYC today. I’ll be playing on the next show with Román Díaz, and I’ve been studying Afro-Cuban music with singer Melvis Santa to begin to understand that amazing tradition. Brooklyn Raga Massive has a bunch of amazing projects that I am playing on or helping produce. We just released our album of Terry Riley’s piece, In C, and are headed to Hawaii to perform it in November. We have a weekly jam session, which is a great open series where any musician can take part. That inclusive session is at the heart of the whole movement. I’ve got my Acoustic Mandala Project, which makes music for yoga and meditation, so there are some retreats on the books for that, as well. Dana Hanchard is my favorite musician, and we’ve got some dates with her group Karavan Kosmiko, and I’m starting to produce some music events for Airbnb. It’s still under wraps, but you’ll hear about them soon! Brooklyn Raga Massive, now a globally recognized musician’s collective, is made up of world class, forward thinking musicians rooted in Indian classical music. After a rousing performance at our recent Block Party, Brooklyn Raga Massive will return to the Rubin for two special shows. On August 12, they will bring their well-known Wednesday Night Jam session to the Museum, and onAugust 28, the BRM All Stars will perform the piece credited with creating minimalism: Terry Riley’s composition “In C”. 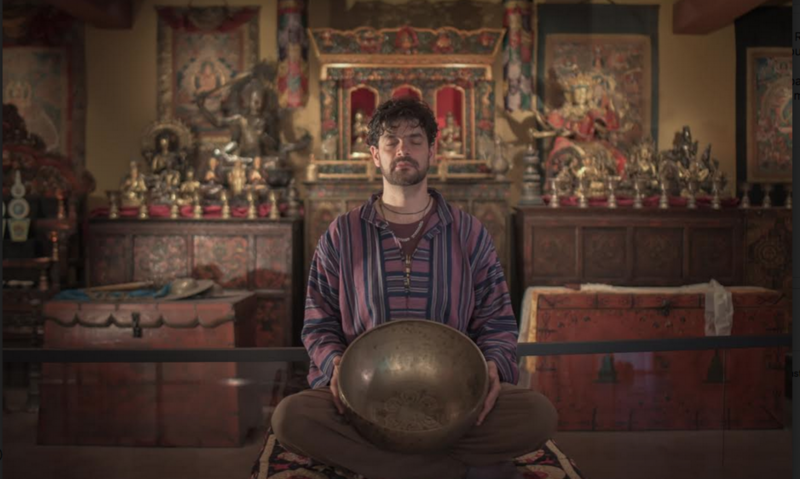 We caught up with musician, producer, and radio host David Ellenbogen of Brooklyn Raga Massive to tell us about raga’s mass appeal, what Indian classical music has in common with Philip Glass and yoga, and why the group can’t seem to get enough of the Rubin. How would you describe Brooklyn Raga Massive and your influences? Brooklyn Raga Massive is an artist’s collective of musicians who are inspired by and dedicated to the Indian classical tradition. There is something magical happening right now. There is a new generation of musicians who are disciples of some of the greatest living Indian Classical musicians, but who also speak the languages of jazz, funk, reggae—not as outsiders, but as insiders of both traditions. Sameer Gupta is a great example of this, touring relentlessly with jazz icon Marc Cary but also deeply studying with one of the greatest tabla players in the world, Anindo Chatterjee. To me, Brooklyn Raga Massive is providing a platform and home for this kind of germination of new styles and languages. It’s also finding new audiences for traditional classical music by keeping the atmosphere festive and fun. At our weekly jam sessions we have new styles emerging, there are Africa/India nights, chamber raga groups and much more. People in India are paying attention to what’s happening in Brooklyn and the term “raga renaissance” has floated around the press there. I am amongst the members who are not as steeped in that classical tradition, but I find endless inspiration and beauty in it. My background as a musician is to study the music wherever I travel, and luckily that has been in India, Mali, Ghana, Brazil and a few other spots. I also play Western styles from Bach to Stevie Wonder. Generally when I join the BRM on stage, I’m introducing a groove element. For example, I can’t imagine anything prettier than the sound of an Afro-Brazilian Bahiana with, say, an Indian, bansuri flute. For those who have never heard it before, how would you describe raga music? Literally, they say raga means “to color the mind.” The music is very subtle and precise in order to capture a specific mood to match a specific time of day. There are evening ragas (which may be more romantic) and morning ragas (which may be more energizing or devotional) and so on. It harmonizes you. The pieces begin by slowly introducing each note with a reverence and respect for sound and place that is almost the antithesis of our modern lifestyle. By the end, the music is an explosion of virtuosity and intensity. It’s a journey and much like with yoga, you feel better afterwards. Who might like traditional raga that you wouldn’t necessarily expect? I know two people who are both into something called death metal as well as Indian raga! Tell us about Terry Riley’s “In C” and your decision to perform it. What can people expect at that concert? Terry Riley’s “In C” is an amazing piece and is often credited for creating the style of music called minimalism, which is associated with Philip Glass and Steve Reich. The piece has forty cells of music, short phrases, which are played progressively by the musicians at any time as long as they stay within three or four of the rest of the group. They can come in anywhere on the beat, or multiply or divide the rhythm as they see musically fit….What this creates is a harmonious sea of music, with moments of amazing beauty. The experience could be considered psychedelic, I suppose…especially when combined with psychedelics! It makes a lot of sense to have Indian instruments performing this as Riley was very influenced by raga and studied it quite deeply. However, he has told us that as far as he knows, Brooklyn Raga Massive is the first group of its kind to perform this piece. He responded positively to a clip we sent him and encouraged us to improvise more. It meant a lot to us to get his feedback, and recently we have been approached by a record label we’re fans of that wants to release our version. You’ve had a history of playing at the Rubin Museum (most recently at our Block Party) – is there anything in particular that you like about performing here? What makes it a special place? Performing at the Rubin is a dream come true for us because there is no other cultural institution in NYC so focused on the same ideals. At its best this style of music takes you to the Himalayas—the Rubin certainly does that. In future collaborations we hope to engage more directly and specifically with the artwork: like facets of a diamond, there are a million symphonies in every mandala. 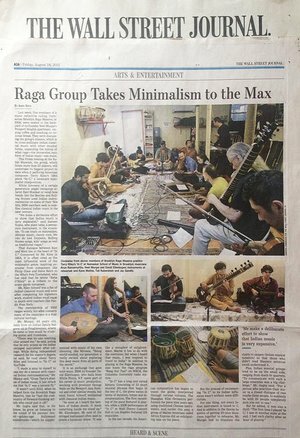 Brooklyn Raga Massive will perform at the Rubin for a special show and jam session on August 12 and an interpretation of “In C” on August 28. 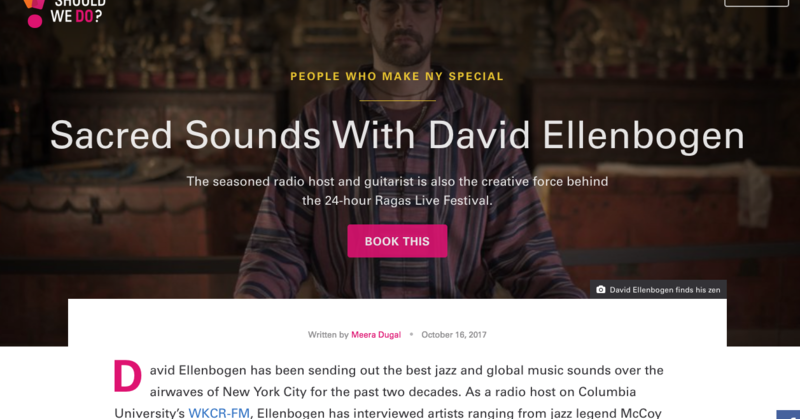 David Ellenbogen is a musician, producer and radio host. His most recent production was last month’s Ragas Live Festival, a 24 hour radio broadcast of Indian Raga, in which over eighty world-class musicians performed live in the studio. You can hear the entire festival and much more at his podcast NYC Radio Live. David will also appear as our guest DJ in the K2 Lounge on August 14. 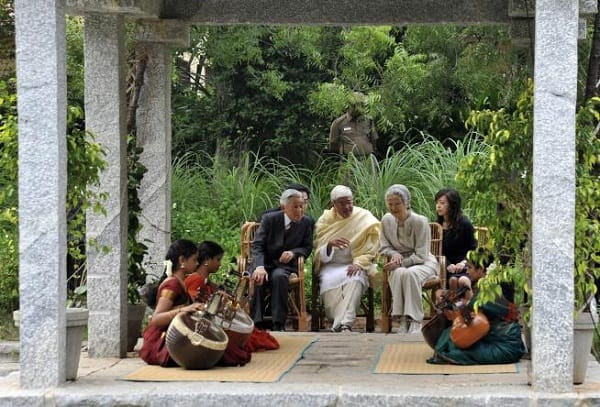 Indian classical music being a long-form proposition, immersion is highly recommended. The diving doesn’t get much deeper than this 24-hour festival, which has been produced since 2012 as a radio program by NYC Radio Live and Brooklyn Raga Massive. .. The jeweled raiment and serene kohl-rimmed eyes of Saraswati, the Hindu goddess of knowledge, music and the arts, were projected on a screen behind the stage one recent evening at Pioneer Works, the exhibition and performance space in Red Hook, Brooklyn. …. Already home to Clocktower Radio—which broadcasts the unparalleled Brazilian music show “Sonoridad”—Pioneer Works in Brooklyn is adding another massive feather to its musical cap: a three-month residency of African and Indian musical collaboration. The Indian classical music collective Brooklyn Raga Massive is launching the residency at the gallery and event space in Brooklyn that will bring together some incredible artists from seemingly disparate musical traditions. The residency kicks off on Feb. 3 with a triple bill that comprises the golden voice of Mali, Awa Sangho, a kora/tabla duo, the Brooklyn Massive All-Stars, and the (their emphasis) original pioneers of the genre, Afrika Meets India, whose lineup includes an mbira, bansuri, kora, sitar and tabla, as well as percussion. Brooklyn Raga Massive has been presenting this concert series for over a year now, so you may have chanced upon an episode as it was broadcast on WKCR 89.9 FM in New York, and those out of the range of Columbia University’s radio station can judge the results for themselves via the podcast nycradiolive.org. Of course, long-time Afropop listeners know just how potent this combination can be, and how despite the distance, there’s been cross pollination between the Asian subcontinent and the African continent over the years. For others, this is a chance for not just good music but an education. Anyone in the area should definitely check it out—we’ll keep the Afropop calendar updated—and anyone outside of the area who wants to check it out can do so online. Terry Riley composed his landmark minimalist composition In C well before he developed an interest in Indian music, but the fit—as seen by Brooklyn Raga Massive—is a natural. The ensemble, which mixes traditional and innovative approaches to Indian music, performs the piece with Riley’s blessing. “BRM co-founder David Ellenbogen, who hails from White Plains, N.Y. spent part of his career in music production, working with producer George Wein on the Newport Jazz Festival and other similar events, but soon found himself enchanted with classical Indian music. “As soon as I heard the tambura of Indian music, it made something inside me stand up,” Mr. Ellenbogen, 38, said of the stringed instrument often used to create a harmonic drone. “It was like a metaphor of enlightenment. Maybe it has to do with the overtones, but when I heard that music, I was inspired to travel to India.” In addition to playing in the Raga Massive, he also hosts the raga program “Raag Aur Taal” on WKCR, the Columbia University radio station. He was bowled over by the immense respect he saw Indians give to ragas, Ellenbogen told Desi Talk. That’s driven him to keep promoting Indian music of all genres on his radio station. On June 20th, that love is manifesting itself in a 24-hour marathon of Indian ragas broadcast live over his radio station, the first of its kind in the Western Hemisphere according to Neel Murgai, founder of Brooklyn RagaMassive, one of several Indian-American music groups that thrive in Manhattan and surrounding boroughs. Ellenbogen calls it “a renaissance” of Indian ragas in the Big Apple. Ellenbogen also has a 72 hours of ragas on his podcast site at nycradiolive.org, which includes his recordings of music from around the world. Several maestros are coming from India including Pandita Tripti Mukherjee , Ustad Aashish Khan , Pandit Tejendra Narayan Majumdar, Pandit Krishna Bhatt , Ustad Mashkoor Ali Khan , Sanghamitra Chatterjee , and Pandit Samir Chatterjee. “Each raga is meant to be played and heard at a certain time of the day and night. So you can hear the late night ragas late at night and the morning ragas in the morning,” Murgai told Desi Talk. Alongside will be emerging performers in the city with classical and new genres such as, Yacouba Sissoko, a Kora player from Mali will perform with bansuri player Jay Gandhi representing the monthly Africa/India Collaboration concerts produced at Brooklyn Raga Massive events. Chamber Raga, a form being explored by musician Karavika will be featured. Prodigy Vivek Pandya who made hisRagas Live debut with a 45 minute solo at 8 years old, will now perform at 10 years old with the maestros Samarth Nagarkar (vocal) and Abhik Mukherjee (sitar). Murgai said because the studios where the musicians will be playing for the live broadcast are small, no audiences can attend. Which is why this year free performances and workshops are scheduled to be held in Central Park on June 21. According to a press release on the station’s website, the Fourth Ragas LiveFestival will have the artistes performing live at studios around the city and broadcast on WKCR midnight to midnight. This will be followed on 21 June by free concerts in Central Park Dairy Lawn. World Music Day: The Ragas Live Festival in New York to hold 24-hour long Indian classical music marathon! A unique 24-hour Indian classical music marathon, the Ragas Live Festival, with a multi-national and multi-ethnic cast of over 60 musicians is set to be broadcast this weekend here and streamed live on the Internet for listeners around the world. It is billed as longest broadcast of Indian classical performed live. “From what I understand, even in India, they have not produced in-studio broadcasts on this scale,” Executive Producer David Ellenbogen said. 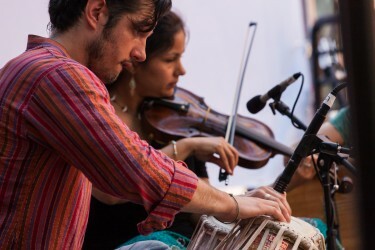 This is the fourth Raga Festival and this year it will add a six-and-a-half-hour free concert at the Central Park on Sunday, which is the day of the Summer Solstice. Sunday is also International Day of Yoga when there will be a yoga session in Times Square with the expected participation of 30,000 people. The Raga Festival is not a part of that program, but it also reflects the growing interest in Indian culture here. 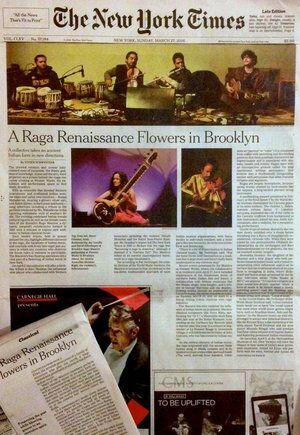 “We are experiencing a raga renaissance in New York City,” Ellenbogen said. “There are so many amazing musicians collaborating within and beyond the genre. This festival is a result of that and has gained a growing international audience.” The festival is a collaboration between Columbia University radio station WKCR 89.9 FM-NY and 13 other organisations. The marathon will be streamed live on www.wkcr.org and it will be archived at the station’s website and at www.nycradiolive.org for listeners to hear it later. A vocal by Ustad Mashkoor Ali Khan will start the marathon broadcast, at 11:59 p.m. Friday night New York Time (Saturday, 9:29 a.m. IST) and will end at midnight Saturday (Sunday, 9:30 a.m. IST) with a vocal by Pandita Tripti Mukherjee. Among the featured musicians are Ustad Aashish Khan, Pandit Tejendra Narayan Majumdar, Pandit Krishna Bhatt, Sanghamitra Chatterjee, and Pandit Samir Chatterjee. Besides Hindustani and Carnatic classical music, the new genres and the collaboration across traditions that are emerging in New York will be represented at the festival. A unique 24-hour Indian classical music marathon, the Ragas Live Festival, with a multi-national and multi-ethnic cast of over 60 musicians is set to be broadcast this weekend here and streamed live on the Internet for listeners around the world. It is billed as longest broadcast of Indian classical performed live. “From what I understand, even in India, they have not produced in-studio broadcasts on this scale,” Executive Producer David Ellenbogen said. Yacouba Sissoko from Mali who plays the kora, a 21-string instrument from West Africa, is to perform with Jay Gandhi on the bansuri and Ellenbogen on the guitar. Sissko and Bansuri perform at the monthly Africa/India Collaboration concerts produced at BrooklynRaga Massive events. Carnatic compositions in jazz interpretations by Arun Ramamurthy Trio (ART) and Chamber Raga form by Karavika are also on the programme.